At Cummings Jewelry Design, we will also service all your existing jewelry. Whether your jewelry needs just a little TLC or a major restoration, we are the place to turn to for the best in jewelry repair and restoration in Birmingham, Alabama. Sometimes all your jewelry needs is a thorough, professional cleaning and polish to be restored to its original glory. We have the experience, expertise, tools and specialized cleaning chemicals to clean valuable jewelry without damaging the surfaces. Removing years of tarnish or the dull film that can build up on jewelry over the years can bring your pieces back to life and restore their original sparkle and brilliance. You will be surprised at how much of a difference it can make, and you will fall in love with your jewelry all over again. Or perhaps your jewelry needs some minor technical assistance. We can help with that too. We can also replace broken or missing clasps and closures on your necklaces and bracelets. And we can restring that glowing set of pearls that outlasted the original string from the necklace your mother gave you. Get the most enjoyment from your jewelry by keeping it wearable and in good condition. And make sure your jewelry fits you comfortably. We can measure and resize a ring that is too loose or too tight. Don’t suffer in a too tight ring or take chances with a ring that is too loose and may slip off your finger and be lost. But although we are happy to take care of all these jobs for you, Cummings Jewelry Design can do much more than just cleaning and making technical repairs. Our qualified team of jewelers can provide complete restoration of your antique and precious jewelry. For example, if you have inherited your grandmother’s ring that is 100 years old and it is damaged or has missing stones, we can fix that. We will go in with a laser and rebuild it. We have hand engravers that will restore it by hand and fill empty spaces with stones that are 100 years old, maintaining the style and look of the era during which the ring was purchased. For any estate pieces that you have, we can rebuild those precious heirlooms to their original specs. Even extremely delicate and intricate designs that were almost impossible to fix in the past have a second chance to be beautiful again with the advancements in laser welding technology. At Cummings Jewelry Design, we not only have the best technology available for repairing your beloved jewelry pieces, we also have decades of experience in caring for jewelry and for our customers. Not all jewelry stores are willing to work on pieces that you have inherited and didn’t buy at that store. And not all jewelry stores have invested in the laser equipment and training that makes extensive restorations possible. But for us, helping you enjoy the jewelry that you already own for generations to come is one of many ways we put our customers first and keep you coming back. 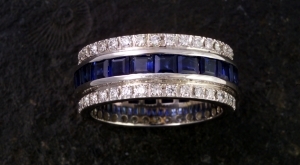 We want to be your number one jewelry repair store in Birmingham, Alabama.